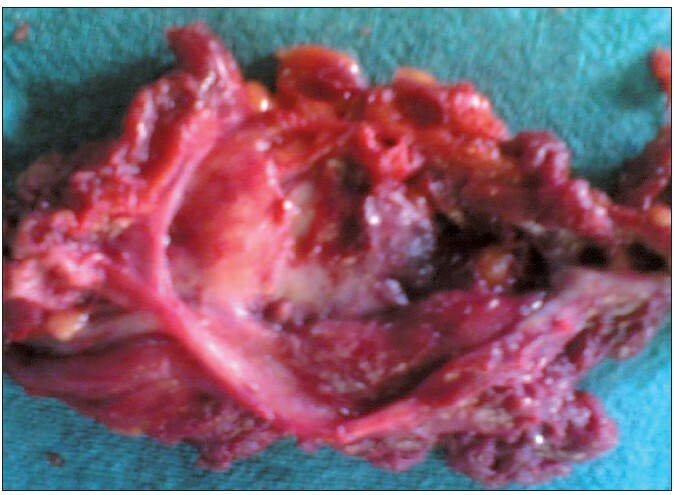 A 35-year-old woman presented with a discharge in the gluteal region since 5 months. She had history of intramuscular injection over the gluteal region from a private practitioner 6 months back, which led to an abscess/ sinus formation. There was yellowish thick discharge, approximately 200-300 ml. Pain in the buttock region was severe in nature in the preceding 2 weeks. History of on-and-off fever was present since 2 months without any cough or vomiting. There was no positive family history of TB. Erythrocyte sedimentation rate was raised (45 mm/h). Mantoux tests and X-rays of chest, spine and pelvis were normal. On local examination, a small opening was seen over the lateral aspect of the right buttock, from which there was a yellowish discharge. It was sent for bacterial culture, which was found to be negative for tuberculosis. Swelling was felt in the right buttock region of size 10 Χ 8 cm, which was firm, non-tender and non-mobile in nature. Skin colour and movements of the lower limbs were normal. An elliptical incision was made and we found that the track was going deep into the muscles and a large cyst was present there [Figure 1]. 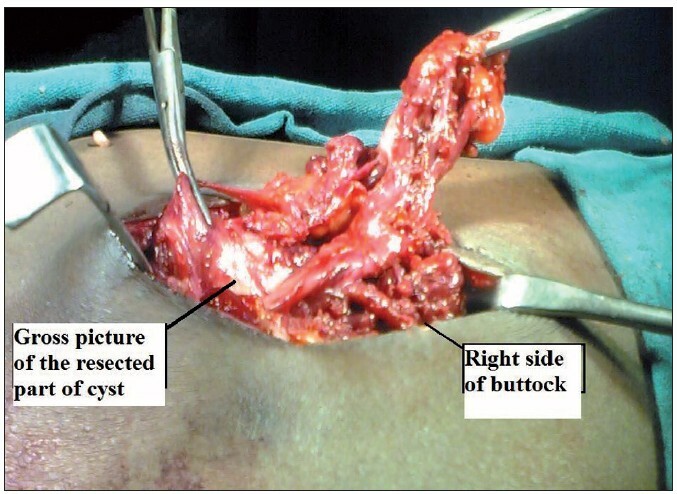 Cyst was of about 10 Χ 8 cm in size, thick walled, adherent to the gluteal muscles and contained yellowish thick fluid [Figure 2]. Sinus and the entire cyst were excised. Skin was closed primarily, along with negative pressure suction drain. Stitches were removed on the 10 th day. At the 6-month follow-up, the patient was asymptomatic without any recurrence. 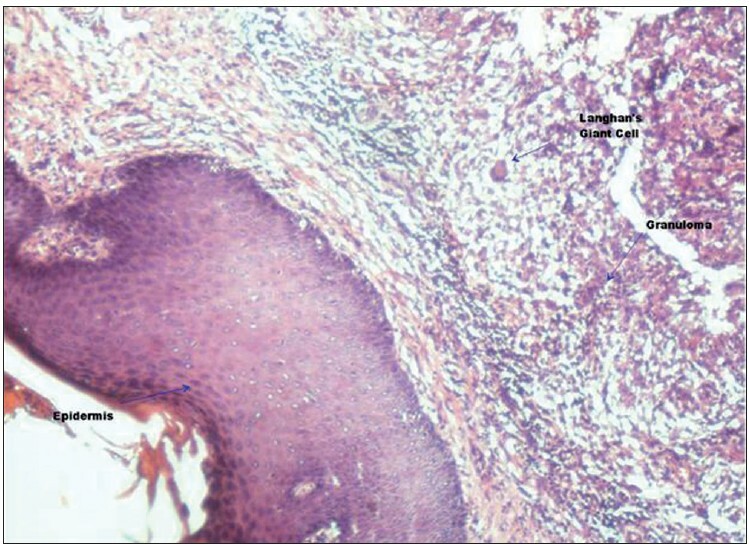 On microscopic examination, large cyst cavity was seen lined by fibrocollagenous tissue showing infiltration by mononuclear cells and occasional Langhan's type of giant cells [Figure 3]. Muscular tissue was normal. 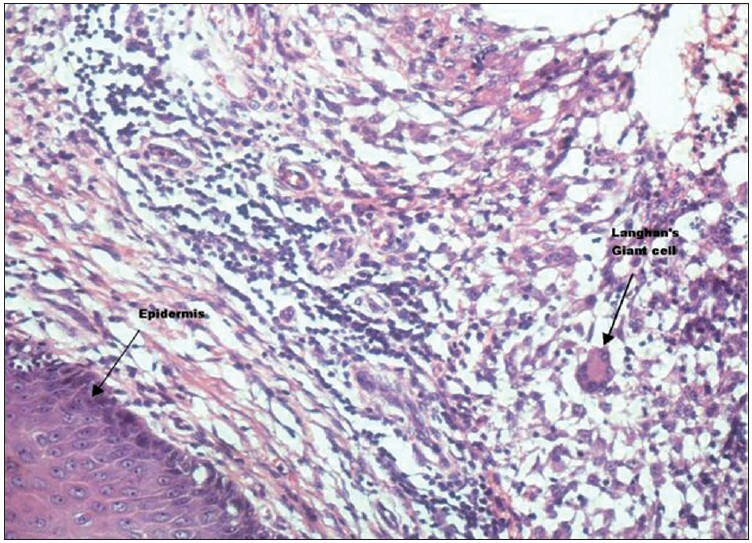 Sub-epidermal tissue showed dense granulomatous infiltrate consisting of epithelioid cells, plasma cells, lymphocytes and numerous Langhan's type of giant cells [Figure 4] and [Figure 5]. The patient was put on antitubercular therapy - rifampicin, isoniazid, pyrazinamide and ethambutol for the first 6 months; and 2 months later, continued with rifampicin and isoniazid. In conclusion, for any swelling/ sinus or cyst at an injection site presenting without any signs of inflammation, and not responding to antibiotics, a possibility of cutaneous tuberculosis should be kept in mind. 1. Sharma SK, Mohan A. Extrapulmonary tuberculosis. Indian J Med Res 2004;120:316-53. 2. Seghal VN, Jain MK, Srivastava G. Changing pattern of cutaneous tuberculosis: A prospective study. Int J Dermatol 1989;28:231-6. 3. Chen CH, Shih JF, Wang LS, Perng RP. 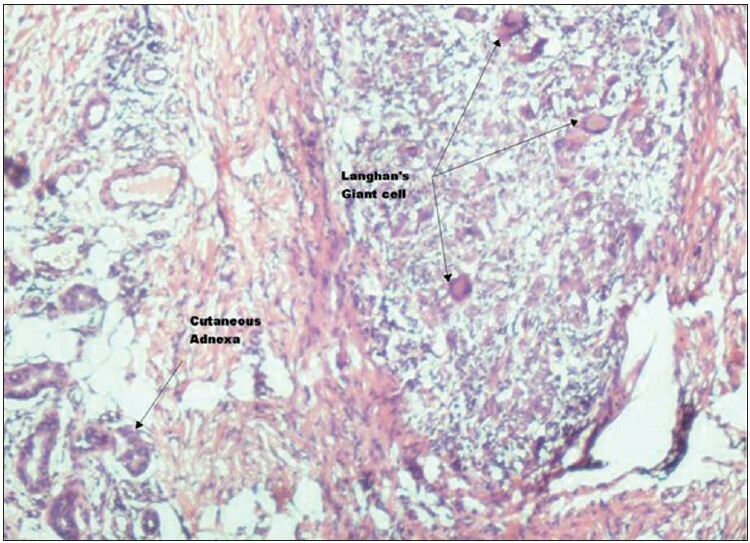 Tuberculous subcutaneous abscess: An analysis of seven cases. Tuber Lung Dis 1996;77:184-7. 4. Speert DP. Tuberculosis. In: Krugman S, Katz SI, Gershon AA, Wilfort CM, editors. Infectious Diseases of Children. 9 th ed. Missouri: Mosby; 1992. p. 551-2. 5. Kovats F, Miskovits G, Hutas I. Experimental studies on the formation of tuberculous abscesses following intramuscular injections. Orv Hetil 1955;96:1126-9.